finalists...a Cree, a Northern Cheyenne, and a Crow. For the final test, the CIA agent took the Cree woman & handed her a gun... "We must know that you will follow your instructions, no matter what the circumstances. Inside this room you will find your husband sitting in a chair. Kill him." The Cree woman said, "you can't be serious. I could never shoot my husband." The agent said, "then you're not the right woman for this job. Take your husband and go home." 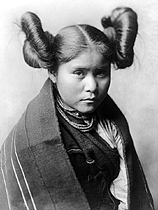 The second woman, a Northern Cheyenne, was given the same instruction. She took the gun & went into the room. All was quiet for about 5 minutes. Then she came out with tears in her eyes, "I tried, but I can't kill my husband". The agent said, "you don't have what it takes. Take your husband and go home." Finally, it was the Crow woman's turn. She was given the same instruction to kill her husband. She took the gun & went into the room. the door opened slowly and there stood the woman. She wiped the sweat from her brow.... "this gun is loaded with blanks!! ", she said, "so I had to beat him to death with the chair." TALK ABOUT THEIR MOONSHINE OPERATION. A LICK WITH HIS TONGUE. THE HILLBILLY WALKS SLOWLY BACK TO THE BAR. MANEUVER', BUT I AIN'T NEVER SEED NOBODY DO IT." coconut whiskey, but at least the English are not getting any. at least the taxes are low and it is not raining. 10. How much white are you? 9. I'm part white myself, you know. 6. Funny, you don't look white. 5. Where's your powdered wig and knickers? 4. Do you live in a covered wagon? 3. What's the meaning behind the square dance? your people, or are they just a short-term fix? 1. Oh wow, I really love your hair! Can I touch it? 2. ...for their quick response to guys saying "shht, shht". 3. ...for any reason to say "Aye!" at the end of a joke. fine grass dancer with the long braids. 8. ...for their ability to make a rez car look good. 9. ...for their ability to change a tire. into the one and only Indian "swimsuit." Casino and still hit the early Saturday morning yard sales. long hair, shady brown eyes, and feather light dancing. of his money out of his own paycheck. the buffet in town to later feed the family. What's the difficulty about drafting a Constitution for Iraq? glass and at below freezing to over 300° C.
The Russians used a pencil. Your taxes will be due again.